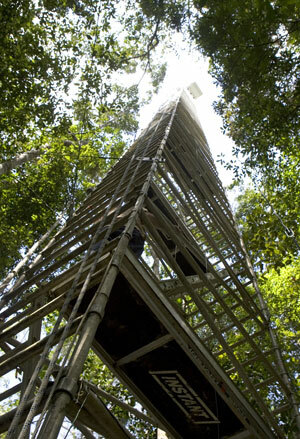 The large scale Biosphere-Atmosphere Experiment in the Amazon [LBA] is an international research initiative lead by Brazil to study the functioning of Amazonia, and the impact of land use change. Delegates took a field trip to one of the nearly 50m towers to observe how the experiment is being conducted. View images of the Symposium field trip here. 1. How does Amazonia currently function as a regional entity? 2. How will changes in land use and climate affect the biological, chemical and physical functions of Amazonia, including the sustainability of development in the area and the global influence?